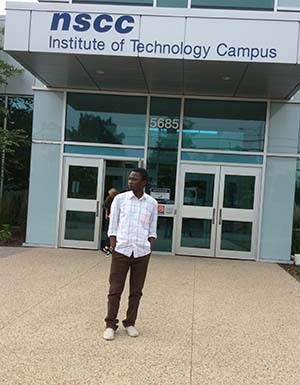 ISTEP Tanzania Nova Scotia Study Tour – After long Safari but the pleasured one from Dar-Zurich-Montreal-Halifax and at last Cambridge Suites Hotel for a night where my life started. Actually I didn’t expect if could make it but for the loves of God at last I made it safely. The next day things were awesome being picked up from Cambridge Suites Hotel for Eco-Cultural Tourism Study Tours in Lunenburg as a port town. We started Experiencing Hands-on Heritage at Ross Farm Museum which the history step back in times and experience life as it once was in Rural Nova Scotia, using skills, animals and tools which was operating the farm of captain William Ross settled in New Ross in 1816 with his family, and 172 disbanded soldiers were “was awesome experience to me. And then to Fisheries Museum of Atlantic where displaying feature the world’s largest collection of Bluenose artifacts and a tribute to those lost at sea from the port of Lunenburg, it was “fantastic” history to me. And then sleeping in a lodge of a person who advocates a rigorous moral code which know as Bluenose, that gave me another exciting moment. Good things continued to Public Libraries/Lifestyle Centre in Bridgewater. The Lifestyle Centre which offers area for exercise, social and Cultural activities and for developing well-being of the people and for us as group having fun with Children and then presentation to them and all people who were there at a time was “cool”. “Ghost” storytelling tour was waoooo. Actually I expected to catch or see the Ghost but at the end of the tour I didn’t catch, see or hear the voice of the Ghost but it was excited tour, and the tour guide herself was also one among the attraction as the history was. Thanks to “Ashlee a Tour guide”. Training tour continued to Black Loyalist Heritage Centre. A Black Loyalist was an inhabitant of British America of African descent who joined British colonial forces during the American Revolutionary War. Many were slaves held by Patriot rebels, and joined the British in exchange for The Crown's promises of freedom. The area is well equipped modern technology “ The history took me back years and years a go. Tour to NSCC Burridge Campus. The campus is totally good. One event which was more excited and honored to me was the whole welcoming process, Meeting with great people in Yarmouth Government like Mayor and others was “waoooo to me”. Experiencing the beauty and natural wonder of the Parks as the only park in CANADA that is designated both a National Park and a National Historic site. And exploring the wilderness trails, lakes, and rivers – on foot or looking people doing kayak, and then sleeping in MERSEY RIVER CHALETS “was pleasure to me. Mi’Kmaq History. As a First Nations people indigenous to Canada's Maritime Provinces and the Gaspé Peninsula of Quebec. And we were told that others today live in Newfoundland and the northeastern region of Maine. The history impressed me a lot. Having a chance of going back to Yarmouth for me and Mr. Saronga with Mr. Tony was another opportunity of learning to me. We did a lot of Training tours to Museums in Yarmouth with Mr. Tony and his wife Patty. “Strengths, Entrepreneurship and Great Teachers Day workshops” at NSCC IT Campus were really healthful to me and back home Tanzania for our students. Because I learnt a lot of things in those workshops, so I will use the knowledge and skills to teach Tanzanian upcoming generation. Thanks to facilitators. Tour of Pier 21 Canada’s Immigration Museum was one among the good tour I made in Halifax. The Canadian Museum of Immigration at Pier 21, is Canada's National Museum of Immigration. The museum is well arranged, well organized and a lot of History to learn. Then we had good presentation at Halifax Public library. Having the “BARBEQUE RECEPTION “with NSCC graduates was fantastic and true love to me and the group in all. Ahsante Sana guys-it was awesome. Peggy’s Cove is said to be the home of over 160 historical lighthouse place is very attractive a lot of giant rocks, much ocean waves as well as area scene itself. NSCC Campus Tours in AKERLEY and WATERFRONT and Project planning meetings were our last training tours/activities before on 24th July 24, 2016 traveling to Truro for CCEDP course. The all two campuses are fantastic, well equipped and nice scene viewing. All in all, I have a lot of people to thank for the whole training tours and those who think about me coming to CANADA. Anyone who gets to read this blog you are the one I thanked too.